Dune 45 is 85 meter high and climbing it is allowed. It is accessed via a paved road so it is one of the most photographed Sand dunes 🙂 . 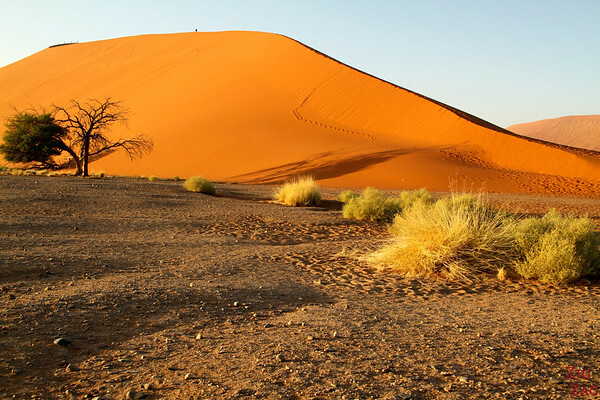 It is part of the Sossusvlei area where dunes are shaped like stars with multiple arms. 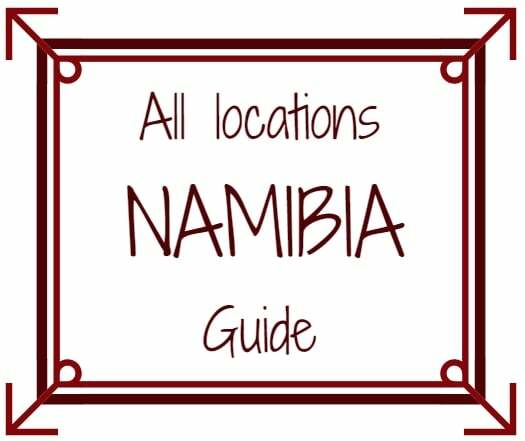 It is one of the top things to do in Namibia. 45km from Sesrium Gate of Sossusvlei on a paved road. Stay at the Sesriem camp and get to the gate at opening time to reach the dune before sunrise (they will tell you at the camp the time). It will be early! 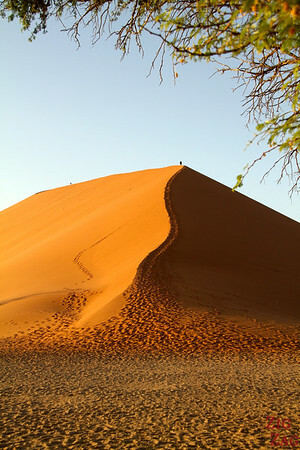 You need to be quite fit to climb the dunes (85m to climb in sand). Make sure to have both hands available and your camera in your bag until you decide to sit. It is easy to fall into the sand. There are no facilities around. 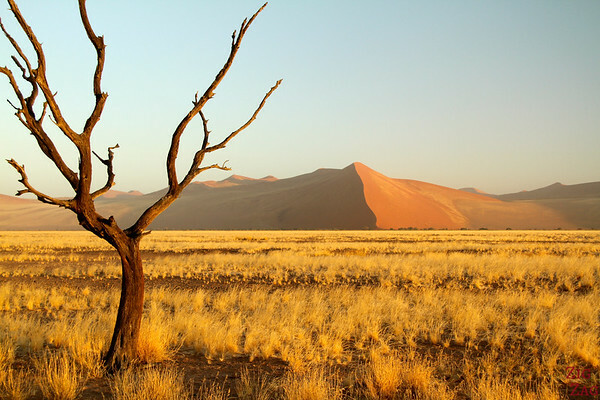 Dune 45 : to climb or not to climb? 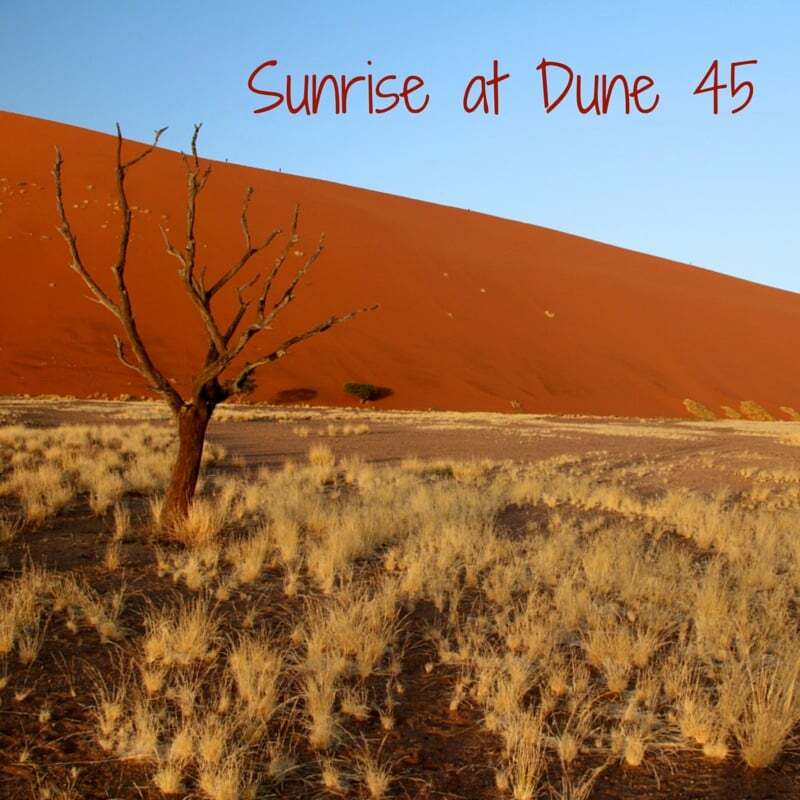 After an afternoon meeting some cheetahs & an evening learning to build my tent and enjoying the discovery of my new travel partners, we all woke up at 4:30 to get ready for sunrise at Dune 45. We were supposed to leave the camp at 5:30 but Oh Miracle everybody was ready at 5:15. In all my group travels I have done this is really a first. What a great chance to have like-minded fellow travelers! 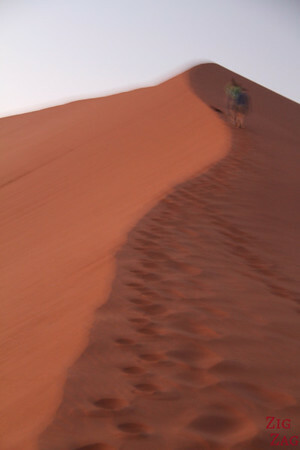 So our group the first one to get to the doors to the Sossusvlei park and the first one at the foot of Dune 45. The plan was to climb Dune 45 to enjoy the sunrise from up there. However I am really bad at walking in the sand, the climb was difficult and I was not able to reach to top of the dune (I had to get out the Ventolin which does not happen often…). So I decided to go back down and walk towards the middle of the vast area between dunes to watch the colors change from there. And I must say I think this was a great decision. Although watching the sun rise from the top of dunes is a amazing fact to be able to tell and you get to see the line up of other dunes, the other persons of my group were not the only one there. 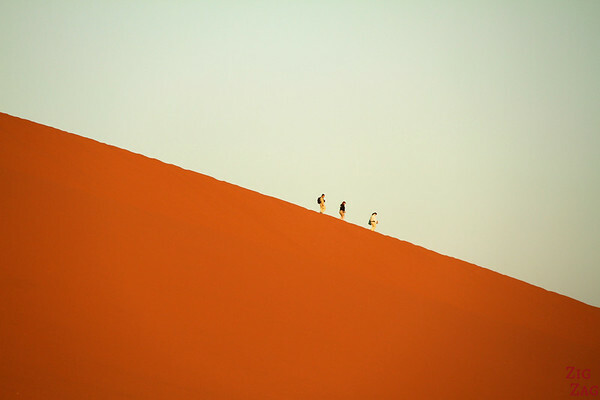 It is the only sand dune you can hike so their experience was not as peaceful as they had wished. But on my side I was totally alone, I could hear the wind in the sand and feel the rays of the sun slowly warming up my skin. I was able to admire the Dune 45 changing colors when the sun hit it. This orange was so intense. I was getting all in.There were sand dunes everywhere with simple perfect shapes. My brain finally stopped thinking and I was in the moment, Nature showing me its best. 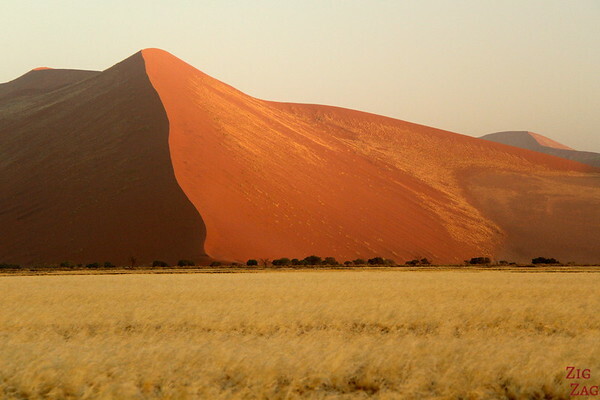 The sand dunes of Sossusvlei are on each side of a flat valley. It is quite strange actually. 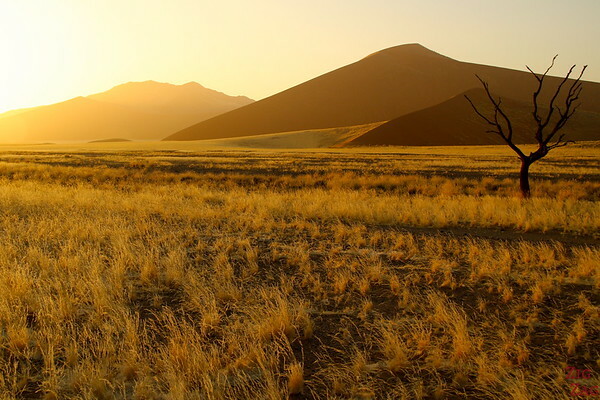 Those 2 pictures were taken from Dune 45 at the dune just across the valley. See more photos of sand dunes on my article dedicated to Sossuvlei in Namibia or the Sahara in Morocco or Wahiba Sands in Oman. Jeremy's five rules for climbing Dune 45. 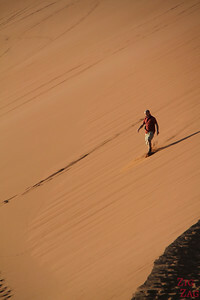 Those photos are great but I am really glad I did not climb Dune 45. I enjoyed my views and the peace and quiet. Plus as I was walking around Dune 45, I was able to take some nice shots of my fellow travelers while they were getting down. 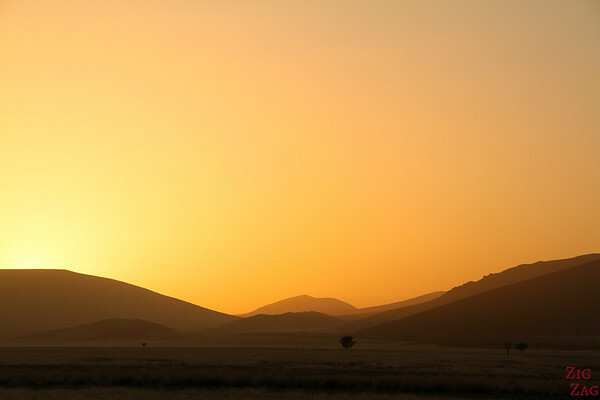 One of the best locations for sunrise, don’t you think?